Carers are an essential part of our community, providing unpaid care for family, friends and neighbours, or for children who are unable to live with their families. Sometimes their caring role may affect carers’ own wellbeing and capacity to live a full and rewarding life. It is important that the valuable contribution of carers is recognised by the wider community. The ACT Government has partnered with Carers ACT to develop the ACT Carers Strategy 2018–2028. The Strategy provides a framework to support and recognise the work of carers, acknowledging the difference they make in our community and responding to key challenges faced by carers. This first three-year Action Plan under the Strategy was developed by the Carers Strategy Taskforce, a collaboration between representatives from government, the community sector and the carer community. The Taskforce used a deliberative approach that ensured diverse voices were heard and encouraged robust and informed discussion of actions to best support carers. I am proud of the way government, the community sector and carers have come together at every stage of the development of the Strategy, ensuring a strong carer voice guides the direction of the Strategy. In particular, I am grateful for the contribution of carers at each stage of the process to develop the Strategy. Their passion and dedication are evident in this work, providing an authentic voice to guide actions that will better support the wellbeing of carers in our community. The Action Plan identifies actions and initiatives that will deliver on the vision, outcomes and priorities established for carers by the Strategy. Implementing the Strategy will help us realise the vision of a community that cares for carers. I look forward to seeing carers supported and acknowledged in their vital role. Carers ;make a vital contribution to the fabric of our Canberra community. In the ACT, approximately 48,000 carers provide unpaid care to family members, friends or neighbours who are living with disability, a physical or mental health condition, or are frail aged. Some provide care to children and young people who are unable to live with their families. Carers assist the people they care for with daily living tasks and support them to more fully participate in society. This contribution is often unrecognised by the wider community and may affect carers’ own wellbeing and capacity to live a full and rewarding life. The ACT Government is committed to recognising and supporting carers, and responding to the needs of carers, their rights, choices and opportunities to participate fully in all areas of life. 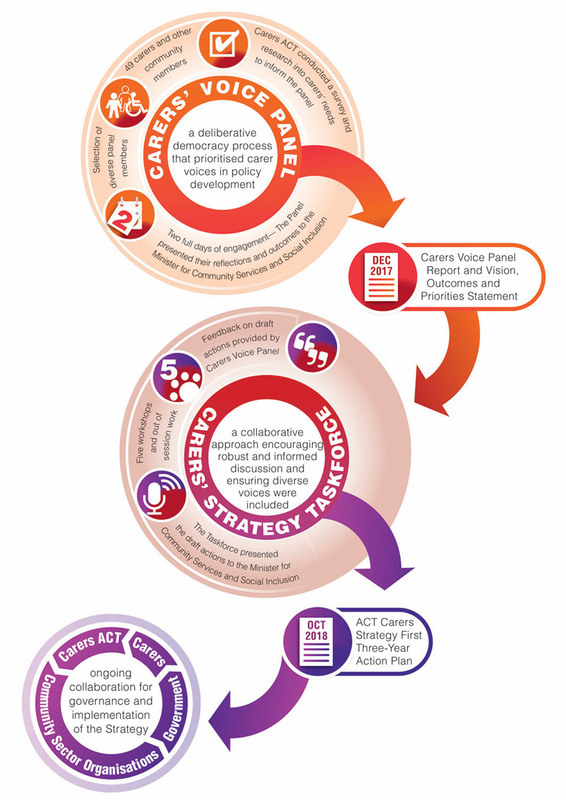 In 2017, the ACT Government partnered with Carers ACT to develop the ACT Carers Strategy 2018–2028 (the Strategy). The Strategy will serve as a framework to support and recognise the work of carers, acknowledging the difference they make in our community. The Strategy seeks to improve the visibility of carers in the community and broaden community appreciation of the essential contribution carers make through their caring role. In 2017, the Carers Voice Deliberative Panel engaged 49 carers and other community members to establish a vision for a carer-friendly city, the outcomes we want to see for carers and our shared priorities. The deliberative democracy process enabled authentic collaboration between government and the carer community in the development of the Strategy, and ensured those in the community with lived experience shaped the focus of the Strategy. The Vision, Outcomes and Priorities Statement and the Carers Voice Panel Report were launched by the Minister for Community Services and Social Inclusion in December 2017. I am so overwhelmed by the knowledge and compassion of people in the room. I love the process. I think it’s extremely valuable. Not just a ticking of the box, it is real consultation. The deliberative democracy process is extremely encouraging, it does show a commitment from the ACT Government to take on these issues. There is a bit of hope that this time the Government will say what they mean and mean what they say. This process has been an amazing and uplifting experience, especially meeting people and finding links that bring us together. My experience of deliberative democracy confirmed that we have a wonderful community with the ability to handle anything. The consultation and engagement processes used to develop the Strategy and Action Plan were highly collaborative, providing genuine engagement between government, the community sector and carers, and ensuring a strong carer voice in driving the direction of the Strategy. Carers make a huge and largely unrecognised contribution to the ACT community and that deserves to be recognised. A better understanding of the role of carers, through increased community awareness, must lead to more support for carers across the ACT society and thus aid their wellbeing and health. The Carers Voice Panel, which helped develop this statement, reflected the diversity of Canberra’s carers. Carers of all ages, culturally and linguistically diverse carers, Aboriginal and Torres Strait Islander carers, and carers with disability participated and were heard. A community that cares for carers and the people they care for. Supporting carers is investing in Canberra’s future. We need to work to educate, build knowledge and understanding of the role and work of carers in the community. Carers need to be recognised in their own right as carers and not just as ‘a significant other’. They need to be recognised by the community at large and identified professionals as being an essential part of the care team because of their comprehensive knowledge of the needs of the person they care for. This will involve improving the knowledge and understanding of the community, medical practitioners, allied health professionals, child protection, educators, police and detention officers, and will result in a positive change in mindset. A community that is proud of its carers, and proud to be a caring community, is able to support carers better. In addition, caring families also need to be recognised as normal families, despite having special needs. We need to recognise the skills, knowledge and experience carers have, how they translate in practice to individuals in their care and enable these to be recognised in the workforce. These skills, knowledge and experience may be able to be mapped to nationally-accredited courses or recognised as prior learning to facilitate workforce engagement or recognition. In addition, improved supports need to be implemented to ensure young carers are supported to complete their formal education and achieve their aspirations. We must develop strategies to increase community understanding of how to relate to people with disabilities, so that we become a more inclusive society. In a caring society, everybody should feel they have an ability, or role, to contribute to the care of those in need. Carers should be proud to identify themselves as a carer, and should have access to support services needed to ensure their own health does not suffer as a result of their caring responsibilities. Carers must have access to support services as needed to ensure their own health does not deteriorate due to their caring responsibilities. These supports need to be tailored for each carer and adaptable as a caring role changes. We must increase the skills within ACT Government agencies, at organisational and individual levels, to work with and respect the needs of carers. Recognition means respect for the skills, knowledge and contribution of carers throughout the community, government, service providers and workplaces. This also means recognition within the legal system and by medical and other professionals, so carers are respected for their knowledge and expertise and are recognised as having valid knowledge about the people they care for. Working side-by-side with the medical and other professionals is what carers want. Education means both increasing opportunities and support for young carers to complete their formal education and achieve their aspirations. It also means recognising the valuable skills, knowledge and experience that people gain by being carers through a form of accreditation and formal recognition. The skills, knowledge and experience of carers should also be validated in the workplace. Improved access to relevant and current information means better access to information that meets the needs of carers. Carers need to be involved in determining their own journey. Carers know the services they need to best support them in their caring role and these do not always align with what is perceived or offered as support. Carers need to be involved in policy formulation and review by government and NGOs, to ensure that services continue to align with their needs. There are a range of support services that are needed or need to be enhanced, reviewed or improved to support carers. Improving support for carers is a responsibility of all levels of government and the broader community, and must take account of the diversity of carers and caring roles. Different types of carers have different needs but all of these needs must be acknowledged. Carers must be treated equitably. The first three-year Action Plan establishes actions that will deliver on the vision, outcomes and priorities established in the Strategy. These actions were developed in 2018 by the Carers Strategy Taskforce using a co-design approach. The Taskforce included representatives from ACT Government directorates and community sector organisations, as well as members of the carer community. The actions in this plan fall broadly under five themes: services and supports for carers; recognition and awareness; inclusion support for young carers; and workforce and skills recognition. The actions under these themes support and deliver on the outcomes and priorities of the Strategy. Ensure services and supports are accessible for carers, including those with disability or health issues of their own. Ensure services and supports are culturally appropriate to meet the needs of carers from our diverse community, including Aboriginal and Torres Strait Islander carers, carers from culturally and linguistically diverse (CALD) communities and LGBTIQ carers. While support for young carers is a theme of the Action Plan, the impact on young carers should be a consideration in the implementation of all actions. Implementation of the actions under the Action Plan will be the shared responsibility of ACT Government directorates and community sector organisations. Collaboration between government and the community sector will be critical in implementing these actions to make a real difference for carers. Governance of the Strategy will be conducted through a deliberative and collaborative approach that involves government, the community sector, including Carers ACT, and members of the carer community. This approach will build upon the key involvement and strong voice of carers that was present in all aspects of the Strategy’s development, ensuring their continued participation in oversight of the Strategy’s implementation. Lead agencies will contribute to an annual Ministerial Statement or update that will be tabled in the ACT Legislative Assembly by the Minister for Community Services and Facilities. The Statement will detail activities and efforts undertaken on actions and outcomes under the Action Plan. The governance group will monitor the implementation of actions under the plan and the completion of actions over the three-year life of the plan. Government, the community sector and carers worked together to develop the three-year Action Plan. We support carers to find and use services to care for their health and wellbeing. We recognise the important contribution carers make to the community. We support young carers to finish school and achieve their goals. Young carers are resilient and connected to their community. We include carers in decisions that impact them. We recognise carers’ expertise about the people they care for. We recognise carers’ knowledge and skills in workplaces. We support carers to balance work with their caring role. Carers are supported to navigate and access services and supports to maintain their health and wellbeing as they undertake their caring role. Develop and deliver a handbook to support improved understanding of the role of kinship and foster carers in the child protection and out of home care systems, including carer participation and engagement in care planning. Deliver programs and activities to help carers, including Aboriginal and Torres Strait Islander carers and culturally and linguistically diverse (CALD) carers, navigate available services and supports, such as mentoring for new carers. Define respite care and promote access to suitable respite care. Support carers to advocate for themselves and the people they care for. Support carers of people with disability to access information and services that assist them in their caring role. Promote digital services that carers can access, including access to government web platforms. Carers feel their role is recognised by the community. The ACT community has a greater awareness of carers and their valuable contribution to our community. Promote carers in the ACT during National Carers Week. Deliver an annual event to celebrate the role and contribution of carers. Develop and implement a communications strategy to promote awareness of carers in the community. Young carers (up to 25 years) are supported to complete their education and achieve their aspirations. Identify and respond to young carers who require additional support in order to remain engaged in education or training. Flexibly support young carers by collaboratively designing individualised learning pathways. Collaborate to link existing programs in order to provide tailored support to meet the education and training needs of young carers. Advocate for the provision of mental health and wellbeing support to young carers. Carers are engaged in government processes in areas that impact them. Carers’ expertise is recognised in decision-making around the people they care for. Employ engagement approaches that enable participation by carers, including in policy development. Seek input from carers on initiatives that promote the rights and inclusion of people with disability. Include carers in consultation and planning for Better Suburbs. Consider carer needs and engage carers in consultations for planning initiatives. Acknowledge carers on health plans, including their role and support needs. Consider carers’ needs during hospital discharge processes. Conduct a carer impact assessment for the ‘Hospital in the Home’ initiative, to consider carers’ needs and their role as part of the care team. Carers’ knowledge and skills are recognised in the workforce. Carers can balance workforce participation with their caring role. Assist carers to navigate the range of relevant, subsidised training opportunities and learning supports available in the ACT. Ensure the views and training needs of carers in the Canberra community are represented during annual consultation on the ACT Skills Needs List. Promote innovative adult community education projects designed to address barriers to carers’ participation in vocational education and training (VET) and employment. Promote carer access to services for culturally and linguistically diverse (CALD), migrant and refugee communities that build skills relevant to workforce participation. Engage the Canberra Business Chamber and private sector to promote employment of carers and support for carer employees. Develop standard wording around recognition and support of carers in the workplace to support advocacy work.